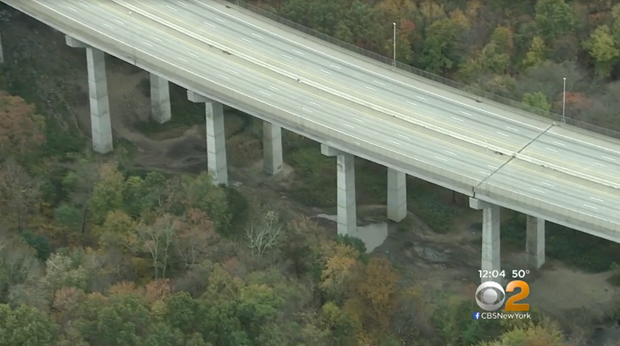 NJ Dad Jumps From Bridge With His 2 Children - Ooooooo La La! Police say it's a miracle how two young boys survived a 100-foot fall off a bridge after their father took them over the side in an attempted murder-suicide in New Jersey Monday night, according to news reports. The father, identified as John Spincken, 37, of Pequannock, plunged off the Wanaque Bridge on I-287. His 1-and 3-year-old sons somehow lived. The boys were found in an area with thick brush and trees near the Wanaque River. Police believe the forest-like terrain helped cushion the impact of their fall. Both suffered concussions and one has a bruised lung, but they're expected to be fine. A high fence is supposed to prevent people from being able to jump over the side of the bridge, but police said Spincken found a way around it. The father was pronounced dead at the scene.